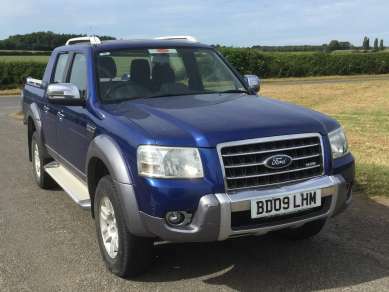 JULY 2009 FORD RANGER 3.0 Tdci WILDTRAK Doublecab Pickup, Blue/Silver, 48,450 Miles, Suede/leather, Remote Central Locking, AIR CON, E/w, E/m, Running Boards, Alloys with 245/70R16 Tyres, chromne rear bar, Roof Rails, Armadillo Roll n Lock rear cover, Towbar. Service History. MOT 1st JULY 2019.